Casey Roark, a graduate student in Carnegie Mellon University’s Psychology Department, was recently selected as an early career policy ambassador by the Society for Neuroscience. The one-year program is open to scientists interested in science policy and advocacy, and provides them with the opportunity to interact with leading neuroscience advocates and the policymakers who make the decisions that determine the future of scientific research. As an Early Career Policy Ambassador, Roark traveled to Washington, D.C. on Capitol Hill Day to engage with members of Congress and their staff to advocate for an increase in the National Institute of Health (NIH) funding to maintain the research momentum and innovation. Congress has since agreed to increase the NIH funding by $3 billion. Roark studies ways to simplify learning challenges—like grasping the sounds of a new language—for listeners. 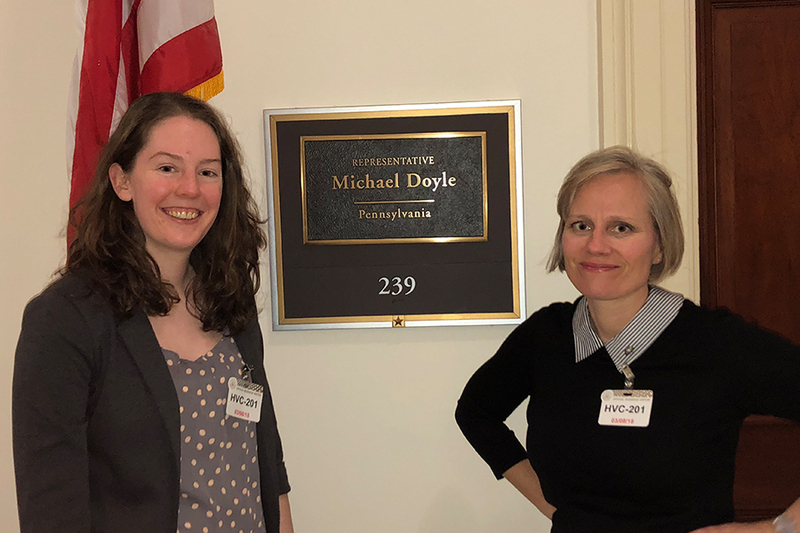 Photo above: Pictured are Casey Roark and Alison Barth, professor of biological sciences, outside of Rep. Mike Doyle’s office.